This Australian fantasy movie has everything you would expect to see in a Hollywood Blockbuster movie that a first for filmmaker Shane Abbess. 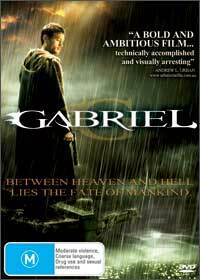 Featuring a wide mix of religious influences from different cultures, Gabriel tells the story of the endless war between the fallen and arch angels of Heaven as they fight for the victor of mankind. The movie is reminiscent of films such as the Matrix with its edgy story telling and rainy nights as these angels walk the streets of humanity. With some great acting by Andy Whitfield and Dwaine Stevenson, this low budget horror/thriller may lose itself in some parts of the story but the action scenes are easily worth the admission price alone. A thrilling and entertaining ride from start to finish with a battle for control over a city and its population of reborn souls. Presented in a widescreen aspect ratio of 16:9, the overall colours of the movie are quite subdued but I'm guessing that this is what filmmaker Shane Abbess was trying to achieve. Match that with some great audio quality of Dolby Digital 5.1 and at the end of the day, Gabriel is a rather visually and audio impressive movie.